Jethro solves the inherent latency problems of Hadoop and delivers business users an interactive BI experience. Jethro eliminates the need for data engineering workarounds. Achieve real-time query response times with a live data connection. We use a Cloudera CDH5 cluster and a Jethro server configured to connect to the Hadoop cluster as a different user. Learn how to connect Tableau to Jethro and create your dashboards quickly and easily. Learn why Hadoop wasn't designed for business analytics and how to overcome this shortfall. We discuss connecting Jethro to MapR using their interface, as if it was a local file system. You'll learn about Symphony's BI applications and how Jethro transparently accelerates performance at scale at a fraction of the cost. See how easy it is to create an instance in Jethro and load 10 million rows of TPC. Next, we show you how to connect to Tableau and begin your BI analysis. A comprehensive data platform that responds to BI queries at interactive speeds. 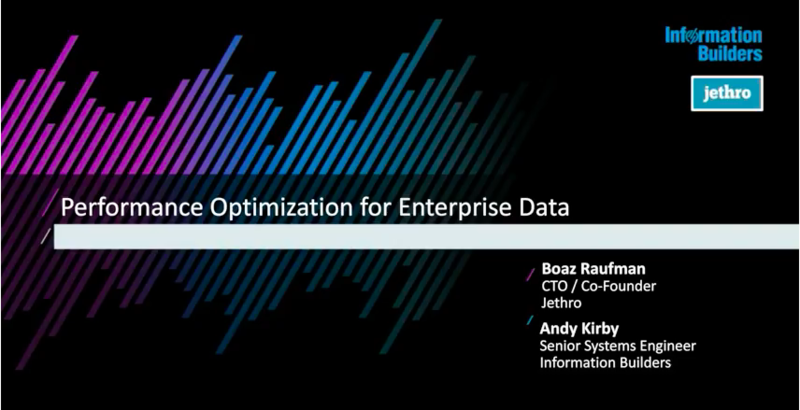 Scaling your BI applications to thousands of concurrent users with the right architecture. Data Realty leverages Jethro and Tableau to deliver users healthcare insights lightning fast. Learn how indexes, cubes and cache work in tandem to deliver interactive BI at any scale. Full indexing and auto cubes work together to answer all query types. The technology on how to achieve a truly interactive response time. Learn how to make VizQL work in the best way possible with Jethro. Fast, consistent performance across multiple query types and scaling for hundreds of concurrent users. Delivering a truly interactive business intelligence experience on a large multi-tenant Hadoop cluster. 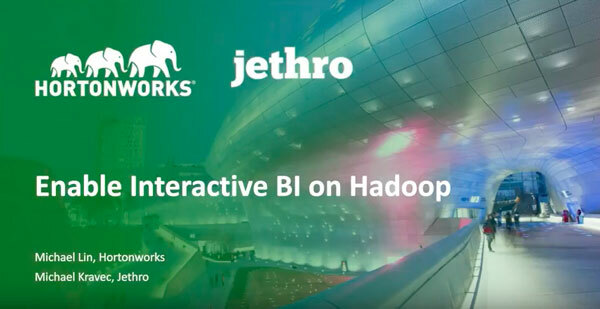 Customers use Jethro to deliver Interactive BI service at attractive Hadoop costs, while supporting all SQL queries. Jethro for Qlik enables using SQL- on-Hadoop to gain near real-time access to big data with QlikView® and Qlik® Sense. Customers use Jethro to accelerate Tableau to deliver Interactive BI service while live connected to big data.